Not to be confused with Cameron, Texas. Cameron County, officially the County of Cameron, is the southernmost county in the U.S. state of Texas. As of the 2010 census, its population was 406,220  Its county seat is Brownsville. 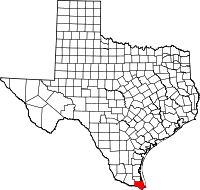 Cameron County is part of the Brownsville–Harlingen, TX Metropolitan Statistical Area as well as the Brownsville–Harlingen–Raymondville, TX Combined Statistical Area, which itself is part of the larger Rio Grande Valley region. According to the U.S. Census Bureau, the county has a total area of 1,276 square miles (3,300 km2), of which 891 square miles (2,310 km2) is land and 386 square miles (1,000 km2) (30%) is water. To the east, the county borders the Gulf of Mexico. As of the census of 2010, there were 406,220 people, 119,631 households, and 96,579 families residing in the county. The population density was 370 people per square mile (143/km²). There were 141,924 housing units at an average density of 132 per square mile (51/km²). The racial makeup of the county was 87.0% White, 0.5% Black or African American, 0.4% Native American, 0.7% Asian, 0.03% Pacific Islander, 9.8% from other races, and 1.5% from two or more races. 88.1% of the population were Hispanic or Latino of any race. There were 119,631 households out of which 50.3% had children under the age of 18 living with them, 60.80% were married couples living together, 20.0% had a female householder with no husband present, and 19.3% were non-families. 16.40% of all households were made up of individuals and 7.30% had someone living alone who was 65 years of age or older. The average household size was 3.36 and the average family size was 3.80. In the county, the population was spread out with 33.0% under the age of 18, 9.7% from 18 to 24, 25.6% from 25 to 44, 20.6% from 45 to 64, and 11.10% who were 65 years of age or older. The median age was 30.6 years. For every 100 females there were 91.90 males. For every 100 females age 18 and over, there were 86.30 males. The median income for a household in the county was $31,264, and the median income for a family was $33,770. Males had a median income of $21,410 versus $15,597 for females. The per capita income for the county was $13,695. About 30.0% of families and 34.7% of the population were below the poverty line, including 46.8% of those under age 18 and 24.8% of those age 65 or over. A 2000 Texas A&M study stated that of the residents of Cameron County, 43% do not have basic literacy skills. U.S. Immigration and Customs Enforcement operates the Port Isabel Service Processing Center, located in an unincorporated area adjacent to the Port Isabel-Cameron County Airport, which is itself owned and operated by the county. The airport has four runways and offers fuel and other general aviation services. U.S. District Judge Andrew S. Hanen stated in 2013 that the corruption in the county judiciary and legal system was so pervasive that most people would not believe it "unless they heard it themselves." County Judge Carlos Cascos will step down after eight years in the position in January 2015 to become Secretary of State of Texas in the new administration of Governor Greg Abbott. Cascos had just won a third term as county judge in the same November 4, 2014 general election in which Abbott defeated the Democrat Wendy R. Davis. In 2006, Cascos had unseated County Judge Gilberto Hinojosa, who in 2012 became the state chairman of the Texas Democratic Party. As of 2006, officeholders tend to be Democrats. As of 2006, about 20,000 to 30,000 people in Cameron County vote in primary elections, and Presidential elections have higher turnouts. Politiqueras, women hired to help elderly people vote, are crucial in South Texas elections. Cecilia Ballí of Texas Monthly wrote that voters expect to get favors from politicians they vote for, and if they do not get these favors they become resentful of politicians as a whole. In addition, residents are eligible to apply to South Texas Independent School District's magnet schools. SpaceX has been approved by the FAA to build a private spaceport east of Brownsville on the Gulf Coast. The SpaceX South Texas Launch Site is projected to employ 75–100 full-time workers in the early years with up to 150 full-time employees/contractors by 2019. In 2014, Space-X acquired additional land near Boca Chica which they consolidated into a subdivision labelled "Mars Crossing," possibly named after the novel by science-fiction writer Geoffrey A. Landis. A picture of the Cameron County Courthouse (1912), the Dancy Building, in Brownsville, Texas which served as the County Courthouse before the construction of the current Courthouse. It was restored in 2006 and now houses County Court at Law No 1 as well as some county offices. ^ "DeWitt Colony Militia Captains". Tamu.edu. Archived from the original on 2011-01-10. Retrieved 2012-05-14. ^ "What's New & FAQs QuickFacts. Cameron County, Texas". Retrieved April 25, 2018. ^ Clark, Steve. "Borders liquidation to bring down local Waldenbooks." The Brownsville Herald. July 20, 2011. Retrieved on July 21, 2011. ^ "Port Isabel Service Processing Center." U.S. Immigration and Customs Enforcement. Retrieved on 21.July 2010. ^ "Texas Airport Directory - Port Isabel, Port Isabel-Cameron County (PIL)" (PDF). Texas Department of Transportation. Retrieved 5 May 2018. ^ FAA Airport Master Record for PIL (Form 5010 PDF). Federal Aviation Administration, Effective 26 April 2018. ^ Perez-Treviño, Emma. "Judge: Hard to believe depths of Cameron County corruption." Valley Morning Star at The Monitor. Wednesday, January 1, 2014. Retrieved on January 5, 2014. ^ John Reynolds and Reeve Hamilton (November 11, 2014). "Abbott Says He Will Name Cascos as Secretary of State". The Texas Tribune. Retrieved December 4, 2014. ^ Martinez, Laura (2012-04-10). "Brownsville area candidate for spaceport". The Monitor. Archived from the original on 2012-04-14. Retrieved 2012-05-12. ^ a b Nield, George C. (April 2014). Draft Environmental Impact Statement: SpaceX Texas Launch Site (PDF) (Report). 1. Federal Aviation Administration, Office of Commercial Space Transportation. Archived from the original on 2013-12-07. ^ Perez-Treviño, Emma (2014-02-19). "SpaceX continues local land purchases". Valley Morning Star. Retrieved 2014-02-19. ^ "99.5 La Nueva FM KKPS musica regional Mexicana". ^ "Inicio - RADIO JOSE McAllen". 19 July 2012. ^ Staff, 107.9 Mix FM. "107.9 Mix FM - KVLY". ^ "Faith, Hope, and Love: KVMV 96.9FM". KVMV 96.9FM.